The recent economic crisis gives an example of how the perception of the future can change, and how the level of economic security affects our behavior. While before the economic crisis, many people preferred to spend rather than save, since the economic perspectives have changed, so has the behavior. A similar behavior, but at business level, is the reluctance of companies to hire when the economic outlook is uncertain. Readiness to act to build the future depends greatly on people’s perception of what that very word means to them. Some have such comfortable lives that they actually do not think much about the future. They consider it a given, and take the current situation for granted. They have not much incentive to change. They might be in for a surprise someday, though. On the opposite end of this, there are those who have no expectation of the future. For them, life is so insecure because of famine, disease or violence, that all that matters is the here and now. Thinking ahead is almost impossible, and all that matters is the immediate. The future is irrelevant. For those who live between these two extremes, the goal is to see life conditions improve. However, how this can be achieved, and whether it seems realistic depends greatly on the resources available. Although many areas of the food and agriculture value chain need to be improved and can be improved, it is important to notice how much resistance many food security plans are facing during their execution. Obviously not all participants agree on the objectives and on the steps to follow. This is especially important in developing countries where many problems affect food security, such as limited financial resources, limited water availability, post-harvest losses or difficult access to market to name a few. To get people to believe in “the” future, the first step is to connect to their sense of how far the future is. When you are 20 in a country where the life expectancy is 80, thinking about the future is quite normal, and the life expectancy gives an indication of the period that the privileged ones have in mind. In regions where life prospects are dire, thinking even a couple of years ahead will probably be irrelevant to many. When presenting a vision of the future, one must consider this way of thinking. The acceptance and the commitment to implement actions will depend largely on whether the timeline is perceived as reasonable. People are more inclined to participate when they think that they will be able to see the results in their lifetime. On the way to the future, actions are always more convincing than words. Positive results need to appear soon. Otherwise, the momentum in favor of the promised changes might slow down. This is why a good strategy is to start with the simplest and the easiest projects. They will deliver results faster. As success breeds success, they will generate more enthusiasm for the more difficult projects that require more time and more resources to be completed. This approach is a good way to build credibility and defuse criticism. Another advantage is that the participants will become more aware of what they can achieve as they achieve success. This gain in confidence will boost the morale to pursue with the further improvements. Often, this creates very healthy bottom-up dynamics that generates newer ideas on how to achieve the goals better and faster, or even exceed them. Clearly, increasing confidence requires actions at many different levels. In the case of food security, the scope needs to go beyond agricultural development alone. Producing more food will not feed people if the hungry ones still do not make enough money to pay for food. Agriculture is only one of the economic sectors, and it will not produce miracles if it is not included in a more ambitious and broader goal. Of all activities carried out to improve food security, I find the Chinese policies rather interesting. They are a long-term oriented culture. They are very patient and persistent, as many episodes of their history demonstrate. Their development activities in Africa are comprehensive. Next to all their work to develop agricultural production, they also invest heavily in the development of small businesses. They are working to develop the local economy beyond simply food production. Possibly, they experience of the last 30 years in developing the economy in China explains their approach. They know that social stability depends on people having at least the bare necessities. In the 1990s, I remember when we, in Europe, started to realize that China’s goal was to feed its people first. Imports of agricultural commodities into China started to increase. In particular, their demand for wheat and for what Europeans considered animal by-products was strongly on the rise. They seem to have a similar approach with Africa. They understand that their food supply will be more secure if the countries where they invest are economically and socially stable. It is worth noting that China invests more money in Africa than all G8 countries together do. It would appear that, to follow through with these policies, not having elections every few years allows them to execute a long-term vision without having to sacrifice it through short-term distraction. On the other end of the spectrum, in terms of making people lose faith in the future, I could mention Libyan land purchases in Mali. The farmers, who had been working the land for themselves, although the land did not belong to them, have received notice that they will have to leave at the end of this year. This is exactly the kind of practice that could lead a country into civil war. Businesses and non-profits that are active to develop food production need to take into account the same aspects that increase confidence in the execution of their plans. The owners, shareholders and fund providers must take a long-term approach to succeed. In such projects, the day-to-day share price on the stock exchange is not relevant. Such projects are long-term investments that will deliver a return only after many years. Among the most important investments, I would give a special mention to health and education. Without them, people can simply not get any fulfilling occupation, and economic development will be stuck in low gear. At my modest level, I once inherited a project to get a fish processing plant operational. This project was a taking place in one of British Columbia’s Central Coast First Nations communities, which was plagued by a staggering 80% unemployment rate. Apart from the fact that there had been no budget allocated, I faced another problem. The local Economic Development Corporation in charge of their end of the project was never carrying out what they were supposed to do. Being my old little me, I never accepted this situation as a reality, and I made sure that all parties would do what they agreed to do. Only after a couple of years did I get the explanation for their dragging their feet. Many projects had taken place in this community before, but they all failed. The locals had concluded that no project would ever succeed, and they were not adamant to invest much in the future. The initial agreement had been signed between the salmon farming company and the leaders of the community, but time was necessary to get the lower levels of the village to be convinced. At some point in time, I was told that if it had not been for my indestructible faith in the project’s success, my persistence and my sometimes quasi-obnoxious insistence, this project would have had the same fate as the other previous ones. I had to deal with many heated discussions, a small social upheaval and death threats, but I quite alive to say proudly that, 11 years after I started it, the plant still is operational today, for the benefit of the community and its residents! Long-term vision, empathy, sharing the value, strong leadership (even some dose of benevolent dictatorship) are all critical elements to make developing nations believe in the future. Copyright 2011 – The Happy Future Group Consulting Ltd. Since the price hike of food and other commodities in 2008, agriculture is one of the hot topics in the investment community. This is also fuelled by the perception that the world might face a food crisis. For those looking at investing in the food sector, there are many possibilities, but in this sector as in many other investment types, caution is required. The investment community is a pool of sharks, and the name of the game is to sell at a profit. Beware of the salesperson! According to Jim Rogers, a famous investor and former partner of George Soros, farmers will be the ones driving Maseratis in the future. He believes firmly that, in the future, those who actually produce the commodities, instead of brokers, will make fortunes. It is a very interesting point of view, although history tends to show that the power in food value chains is in both ends of the chain: genetics and marketing to consumers. Becoming a farmer is not an investment. It is a job, and a busy one. Farmers need to generate cash on a regular basis to provide for their families and keep the farm in business. Land is not liquid. Investing is about reaping the profit when selling at a higher valuation. For those interested in owning farmland, there are possibilities to buy large acreage in many countries. A recent article published in CNBC presents some strategies. Large private investors seem interested in Brazil, Argentina, Uruguay and Canada. Prices of farmland have been firming up in the US. There are people advertising for Brazilian farmland who promise you a yearly guaranteed (not clear how, though) of 12%. In the former communist Eastern European countries, many farms are for sale. Net importing countries such as China, India and Arab countries choose to invest and develop farmland in Africa. For investors with a strong stomach, Africa may be a place of choice. The continent is pretty much for sale. However, the ownership of the land is not always very clear and the rules of engagements may vary. If you only wish to lease land, you might be interested in Ethiopia: the country is offering 100-year leases for $1 per acre. Although some offers may seem irresistible, buying farmland or a farm is a complex endeavour. Many factors weigh and things may not be as they seem. What is the quality of the soils? How is the climate, and in particular are there risks of floods or drought? Is there proper access to water? What are the local regulations in the country where you are thinking of buying? How much bureaucracy should you expect? Who are the suppliers, and how they deal with their customers? Is there access to quality supplies? What are the banking facilities and what type of credit can you get? How are the infrastructures for storage and logistics? What access to markets do farmers have, and how is the marketing chain organized? Today’s situation may not be a good predictor of the future, and problems may loom ahead, as Jason Henderson, vice president and Omaha Branch executive of the Federal Reserve Bank of Kansas City told in an interview to Agri-pulse. If farming or owning farmland is not your thing, there is always the possibility to invest in commodities with futures contracts. Instead of buying the hard commodity, which would take quite some space in your garage, you just do the same but on paper only. This is a risky business though and it should be left to the pros. Originally, futures had been introduced to give farmers the possibility to fix in advance the selling price for their crops, instead of waiting for the spot market at harvest time. Futures contracts have been taken over by the Wall Street geniuses who brought us the Great Recession. Also realize that nowadays the future contracts prices reflect the supply and demand situation of paper contracts, not of the actual physical market. The result is that futures markets are all about speculation and most transactions are made with borrowed money. Speculation may be about the weather, planted acreage, expected yields or plant diseases. Any news is cause for rumours and markets may change direction without warning. If agricultural commodities interest you, you may prefer to invest in funds that include these commodities, and therefore offer a lower risk. Another possibility to get money at work in the agriculture and food sectors is by buying shares of companies involved in agricultural value chains. For instance, when commodity prices increase strongly, the logical (?) thinking of stock investors is that the next food crisis is ahead and that the world is about to run short of food, which will stimulate farmers to plant more and therefore require more inputs. Especially shares of fertilizer suppliers always shoot up in such situations, all the more so as there are just a few of them. This gives them a strong bargaining position, and they pass on sharp price increases to the farmers… which is why the margins of farmers usually suffer after a year of high commodity prices. In the agricultural sector, it is important to remember what I said about which links in the chain have the strongest position, as this will affect their bargaining position and their ability to get, or to keep, the added value. Weak links will always underperform, while the stronger ones will outperform compared with the average of the sector, that is for as long as these companies are managed properly. Investing in stocks always require a thorough financial analysis, as well as a good understanding of the quality of the management. How does the future look like for a particular company? Does it have a sustainable competitive advantage? How does the future look like for the sector of activity of this company? What is the track record of performance? Does it depend on world market prices or is it more predictable than that? How is the valuation of the company? Another type of investment that is gathering momentum in the agri-food business is new technologies start-ups. With worries about the future of oil, and especially oil prices, and the challenge of providing enough water to produce crops, many new technologies try to find their way to market. The sector of new technologies attracts many investors, probably because it seems reminiscent of what happened in the tech sector, therefore giving hopes of high return. I come across such ventures regularly, and every time I hear enthusiastic stories from the owner or from the venture capitalists involved. In many cases, the story is about how this new technology is going to revolutionize the way food is produced, or even it will be the solution to hunger. Returns on investments always sound amazing, making one wonder why this has not been on the market for some time already. For such projects, too, it is essential to do the proper research on the claims that the owners and financiers are making. In many cases, I find difficult to get the proper background to support the financial results that they claim. In even more cases, I do not see any real thorough market research, and instead of explaining in which niche they will operate, the market story is about macroeconomics. The macroeconomics may be true, but except for the unlikely event that the particular technology would indeed take over the world within a few years, they are not a relevant description of the actual market possibilities within the foreseeable future. Of course, there are also projects that have strong cases, but they are a minority. In all cases, a number of simple rules can save you from a very painful experience. Do not invest in something you do not understand. Do not mind hypes and tips. Take all the necessary time to do your research, and do it thoroughly. When in doubt, do not invest. Ask as many questions as possible. When investing, information is power, and lack of information is weakness. Ask independent third parties, and never ask advice from someone who has a vested interest in your transaction. If it sounds too good to be true, it probably is exactly that. Investing is not mandatory, and if you miss an opportunity, there will be other bargains later again. Everyone who works in agriculture and food knows that there are about one billion people on Earth suffering from hunger. The temptation to think that the cause is a lack of food production is great, but it does not reflect reality. Quite a few serious organizations and personalities claim that one Earth is not enough to feed nine billion people by 2050. Some claim that we would need two Earths. Others even go as far as mentioning the need for three, and even four, of our blue planet. There are two possibilities with such statements. If they are true, then humanity has a problem, because there is only one Earth, and we will not get a second one. In such a case, the only way for supply and demand to get in balance is a reduction of the world population. This could happen through famine, disease and/or wars. Since in such a scenario there is a maximum to the world population, once this number is reached, there must be a constant elimination of the couple of billion people too many, through one of the means just mentioned. This is not a particularly happy thought. On the other hand, if such statements are erroneous, there is hope to feed the increasing world population with one Earth. Then, is one planet enough or not? Simple math should help finding the answer. If we need two Earths to feed nine billion, one planet would only feed 4.5 billion people. Currently, the world population is around seven billion, out of which one billion is hungry. Conclusion is that we currently can feed about six billion people. We are not doing that bad. Is it possible to find ways of feeding three more billion on this Earth? From the simple math above, it is clear that those who claim that we need three Earths or more are wrong. Out of the six billion who do not suffer hunger, it is estimated that one billion is overweight, a part of which, mostly in the USA, is obese. They clearly ingest more calories than they need. Purely theoretically, if those were to share the excess food they consume with the ones who have too little, the billion hungry people would have about enough. This means that today there is already enough food available to feed seven billion people. Another interesting factor is waste. According to the FAO, about 40% of all the food produced is lost and wasted. In rich countries, most of the waste takes place at supermarkets, restaurants and households level. People simply throw away food. In developing countries, the waste takes place mostly post-harvest. The food does not even reach the market. The food is spoiled because of a lack of proper storage facilities and logistics. The food ends up rotting, contaminated with mould or is eaten by vermin. To fix the problem, the FAO estimates the cost to improve infrastructure at US$ 80 billion. This is less than the amount the EU just made available to bail out Ireland. What to say of the US$ 3.3 trillion that the US Federal Reserve lent to banks to alleviate the financial crisis? Of course, it will be impossible to achieve an absolute zero waste, but if we were to achieve 10%, this will feed many people. I have heard the statement that if post-harvest losses were eliminated in India, the country would be fully food secure. Per 100 tons of production, 40% wastage means that only 60 tons are available for consumers. By reducing waste from 40% down to 10%, there would be 90 tons available. This represents an increase of food available by 50%! Since we could already feed seven billion with the 40% waste, reducing wastage to 10% would allow feeding 10.5 billion people. There are also many debates about whether we should eat meat or not. The nutritional need for protein is easily covered with 30 kg of meat per capita per year. I had shown in an earlier article that if Western consumers were consuming just what they need instead of eating superfluous volumes (very tasty and enjoyable, though), it would free meat to feed 1.4 billion people the yearly individual 30 kg. In China, the average meat consumption is already up to 50 kg per capita per year. The consumption is very unevenly distributed, but this is the average. Cutting 20 kg per capita over a population of 1.5 billion would free meat for the nutritional needs of an additional one billion people. The other area of potential is Africa. The FAO estimates that the area of arable land that is not exploited is about 700 million hectares. This is about the size of Australia. To simplify and get an idea of the potential, we can calculate what it means in wheat equivalent. With the assumption that wheat yields would be the same as the current African average, a low 1.5 tons per hectare, this adds up to 1.05 billion tons of wheat. Since a person needs about one million calories per year, and there are about 3,000 calories in a kg of wheat, one ton of wheat can feed three people, the 1.05 billion tons of wheat can feed more than 3 billion people. Normally, there would a crop rotation of at least two harvests per hectare. With proper investment and financing, farms should be able to reach easily the US average of 3 tons of wheat per hectare. Clearly, this performance could be achieved with traditional techniques and good quality seeds. This is not even about high-tech or GMOs. This tremendous potential of Africa is why China, India and Arab countries are very active developing farming there. They did the math. This scenario also shows that Africa can easily become a strong net exporter of food. In this case, the world map of food looks very different. Without Africa being able to produce large amount of foods, the prospects for food security in Asia and the Middle East are a bit bleak. They can depend only on Western Europe, Russia, Ukraine, Kazakhstan, North and South America, and with Australia to a lesser extent. With Africa as a net food exporter, the world map looks a lot more balanced, East-West as well as North-South. Sea routes from Africa with the Arabic Peninsula, the Persian Gulf, and farther away with India and China create a much safer feeling of food security for the countries in those regions. For Africa itself, it may change the relations between Sub-Saharan country and the Maghreb countries. This in turns changes the type of relationship that the Maghreb may have with Europe, by creating more economic activities to the South. Africa’s success –or failure- will affect the whole world. With the above, everyone can develop further assumptions, but these calculations show that this one Earth can produce enough food to cover the needs of between 12 and 15 billion people. It almost sounds impossible to believe, yet these numbers are not even ambitious. I have not even taken into account that in 2009, 25% of the corn produced in the USA was destined to feed cars, not people, via ethanol production, and that number is expected to grow to about one-third for 2010. The potential is even higher when one considers that a large part of the US corn goes into soft drinks, while it could be used to produce tortillas, with a side glass of water, a much healthier alternative. That said, if the potential for food production supply looks adequate, actually producing it may not be as easy. The human factor, especially through politics and leadership, will be crucial to succeed. One would ask why there is hunger if we can produce so much food. The answer is simple. Hunger is not just about food production, it is about poverty. People are hungry because they do not have money to buy food. They do not have money because they do not earn enough, as they have low paying jobs or simply no jobs at all. By developing the economy in these regions, people would get better wages. They could afford more food. The demand would drive the development of food production. Agricultural development would then be a normal and natural activity. Trying to develop agriculture if the locals cannot buy the food cannot work. Recently the FAO estimated that two-thirds of the world’s malnourished live in only seven countries: China, India, Pakistan, Bangladesh, Indonesia, Ethiopia and Congo. These are countries where most of the population is poor, and most of which lives in rural areas. The other proof that hunger is not only a consequence of low food self-sufficiency can be found in two agricultural exports behemoths: Brazil and the USA. In the latter, a recent survey carried out by Hormel Foods, the deli producer, shows that 28% of Americans struggle to get enough money to buy food, or they know someone who struggles. Last year, the USDA had estimated at 14.6% the percentage of US households that do not have enough food on the table. Food will find the money and vice-versa. If Bill Gates decided to move to the poorest and most food insecure place in the world, and would fancy a lobster, I am sure that someone would manage to find him one and deliver it within reasonable short notice. 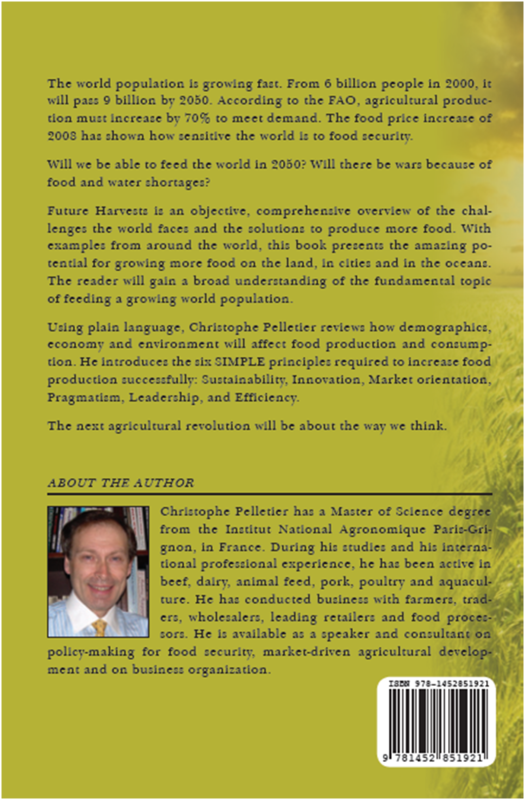 My book, Future Harvests, investigates the possible scenarios to increase food supply and meet the demand at the horizon 2050. Without water, there is no agriculture, there is no food, and there is no life. It is obvious, and yet the water question is too often neglected. The quantity and the quality of water available are absolutely crucial for the future production of food. It will influence where and what type of food we can produce. It will define food security and world politics. Since 70% of fresh water use is for agricultural purposes, it is clear that water will soon be power. The need to preserve water and use it efficiently is going to be one of the main challenges to overcome for the decades to come. This will stimulate innovation and the development of new technologies and new techniques. Field sensors that measure the level of humidity in the air and in the soil connected with “crop per drop” irrigation systems can allow the distribution of the right amount of water at the right time, thus saving waste through evaporation and drainage. The selection of plant varieties will focus more and more on water efficiency. Drought-resistant plants that can thrive in arid conditions are in the works. For instance, a trial on wheat in Australia has delivered promising results, as the yield was 25% higher than non drought-resistant varieties. Researchers, through hybridization and genetic engineering, are working to develop varieties that can use less water and produce similar yields as per today. Although high tech may bring solutions, other methods deliver good results, too. Agro forestry, the production of crops under a cover of trees seems to help farmers achieve satisfying results in the Sahel region. The foliage of the trees helps reduce evaporation from the soil. Combined with proper techniques to apply organic matter and fertilizing elements, farmers can create better conditions for plants to grow. Another field of research is the development of alternatives to traditional desalination, which is very demanding in energy. Transforming seawater into fresh water for the production of food is not simple, and it is expensive. The technology is here. Israel has used it for decades. Currently in the United Arab Emirates, a project of floating islands covered with solar panels to provide the energy to desalinate seawater is being developed. This system has the advantage to produce both fresh water, which is precious in desert countries and clean energy at the same time. A project, called The Sahara Forest Project aiming at producing food in the desert is currently in the works. It combines solar energy, modern biomass production and a type of greenhouse, built by the Seawater Greenhouse company, that helps the humidity produce by the plants to condensate. In many countries, the problem is not so much physical scarcity of water as it is a lack of proper infrastructure to collect, pump and irrigate efficiently. The population density contributes to the problem, because the more people, the less for each of them. In many countries, for instance in India, the equipment is old, inadequate and poorly maintained, because of a lack of finance of governments and farmers. The result is a waste of water resources, and a suboptimal production. Another area that has potential for improvement is the collection and the storage of rainwater. A large quantity of water runs off and is not available for food production because there are not enough containers, if any. Developing and improving storage infrastructure will definitely help farmers to produce more food. If the availability of water is important, so is its quality. In China, the situation is a lack of both, because of the heavy pollution of many streams and rivers. In many areas, the water is there, but it cannot be used, as it is fit neither for human consumption nor for agricultural production. The respective situation of countries about water availability will determine their ability to feed their own people or not. In Arab countries, irrigation has led to a high level of salinity and it has depleted drinking water reserves. Saudi Arabia, for instance, has now abandoned its policy of increasing food production to become be self-sufficient. Saudis are actively purchasing land in African and Asian countries to meet their food needs. China and India, that represent about 40% of the world population, are following a similar approach and invest heavily to help develop land in Africa. In countries where drinking water is scarce, there are discussions about the need of not exporting, as export of food is actually water export as well. If a number of countries face a water shortage, others have a different situation. This is the case for large areas of North America and South America. Especially Brazil disposes of large water reserves. Together with a favourable climate, Brazil has many advantages to produce food, especially animal protein. According to Osler Desouzart of OD Consulting, the production of 1 kg of beef requires 16,000 litres of water, while it takes 6,000 litres for 1 kg of pork and only 2,800 litres for a kg of chicken. This shows why Brazil has been gaining market share in beef and poultry. It indicates that intensive animal production will be more challenging in countries where water is not as abundant. This also tends to show that poultry will be the most successful type of land animal production. The US and Canada have large water reserves, although there are also clear regional differences. The South West of the US becoming increasingly arid, and one can wonder if California, that currently produces most of the fruit and vegetables for the North American continent, will be able to keep its production levels. It is likely that fresh produce will be gradually produced closer, even inside, the large urban centers in the northeast as well. Considering the emphasis on water preservation, it is also interesting to note that before the housing crisis in the US, the most irrigated type of plant production were lawns, using three times as much water as US corn. Food recalls are another source of water waste, especially meat and eggs recalls. From the numbers presented above, it is easy to see how much water is lost when dozens of tons of animal products must be destroyed, not to mention the huge food waste that this represents. When it comes to food and water, aquaculture offers interesting possibilities for the efficient production of protein. Fish produced in the ocean do not consume freshwater. This saves large amounts that can be used for other purposes. However, one of the challenges for the fast-growing aquaculture industry will be to be able to source feed ingredients that do not directly compete with other farm animals and direct human consumption. Land-based aquaculture is developing the very interesting concept of aquaponics, which is a combination of fish production in tanks combined with the production of vegetables indoors. The system recycles the water used for the fish tank, and helps fertilize the plants with fish waste. This is a very water–efficient system that can help produce large amounts of food on a small area, making it fit for urban farming units. 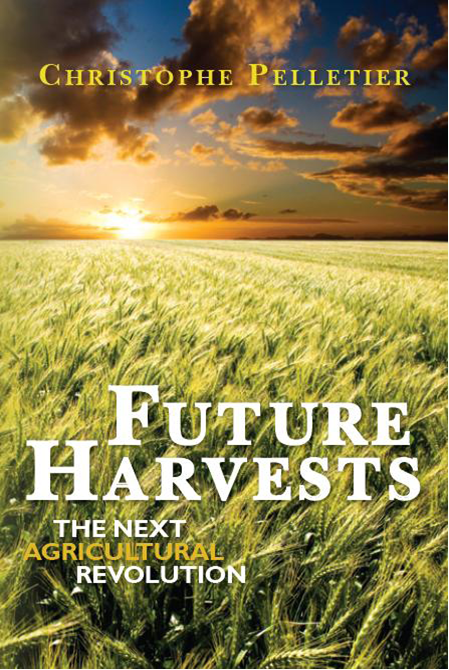 My book, Future Harvests, is expected to be published before the end of August. Here is a preview to give you a flavor of the content. For a full view, please click on the thumbnails. For the video trailers, please visit my YouTube channel. Are “land grabs” a necessary evil? The large land deals between African and Arab countries or Asian countries, mostly China, have drawn quite some attention. I mentioned them in an earlier post on this blog (The great unseen land grab). The discussion has taken an increasing political flavour, but very few people seem to look at the causes of the problem. The reality is simple: the countries looking for land do so because they have a serious problem to feed their people and to guarantee them access to potable drinking water. The water problem is obvious in Arab countries. In the past, they tried to grow more food on their land by developing irrigation. Unfortunately, they have concluded that this approach depleted their water reserves, while they also realize that they cannot feed their increasing population. For instance, Saudi Arabia has now turned away from its previous food security strategy and chooses to preserve water and look for other sources of food than their own agriculture. China and other Asian countries also realize that they cannot meet the increasing demand for food. What should these countries do? Home production will not be sufficient. The first other possibility is to import, but volumes in the current world agriculture will also soon meet limitations. Keeping on buying on the world markets will solve some of the shortage problem, but it leaves the importing countries vulnerable to world market price increases. This is a threat for the domestic social stability as many of their inhabitants can hardly afford food at the current prices. These countries simply cannot remain passive. They needed to take action, and they did. Why is Africa so attractive? Africa is the only continent where agricultural development has lagged behind. Yields are low. Infrastructure is far from optimal. Africa can increase production if African countries can fund their agricultural development. The main problem is one of money and policies. Africa has huge areas of arable land, but that land is not exploited. The FAO estimates at 700 million hectares the amount of land that could be developed for agricultural production. That area is about the size of Australia. It is twice the size of the current world wheat area. This offers huge potential. What the importing countries bring to Africa are funds ready for investing in infrastructure and equipment. They could wait for African governments to develop agriculture and then buy from them. Considering how slow agricultural development has been in the past, this solution probably would come down to waiting for nothing to happen and cause serious food shortages in Asia and Arab countries, with all the risks of conflicts that this would generate. The approach of going to Africa and offering to buy and develop the land makes a lot of sense. By being proactive, the importing countries actually speed up the process of getting investment money at work on the land, and the host countries do not have to worry about how to get the money. Can these land deals work? In theory, they can. The main issue at stake is how both the importing/investing countries and the host countries set up such deals. The population of Africa is very young and it is growing fast. Africa will see its population double within the next 40 years. Africa is also a poor continent and the combination poverty and high population increase has the potential to create many problems because of a lack of food security. Developing agriculture in Africa is the way to increase food security, but at the same time, a large part of the food produced on the newly developed land will go abroad, to China and Arab countries. This is why it is utmost important that such deals be set up as win-win situations. The foreign countries must help create agricultural and economic development in Africa in order to feed the local population by developing food production and offering employment so that they also can buy food. Failure to do so will very likely result in riots and violence against the new farms and their staff. This would not feed the local population, and could eventually result in not feeding the foreign countries either. Such land deals must be managed very carefully. The people in charge will have more than just agriculture to look after. Social, cultural and environmental aspects will play a very important role in the execution of these projects. Africa is the continent where such deals have grown to large proportions, but similar deals are also being made in many Asian nations. It is interesting to see that other regions where large amount of investment money would be useful for agricultural development do not get as much attention from the importing countries. Yet, areas like in Kazakhstan, Ukraine or Russia could use some injection of funds, too. Brazil is starting to attract new money. For instance, the China National Agricultural Development Group Corporation has plans to grow corn and soybeans and it is looking for land in Brazil. The corporation has been allowed an annual budget of US$2 billion to realize the objectives and secure grain supplies to China. More in my upcoming book Future Harvests. Copyright 2010 The Happy Future Group Consulting Ltd.